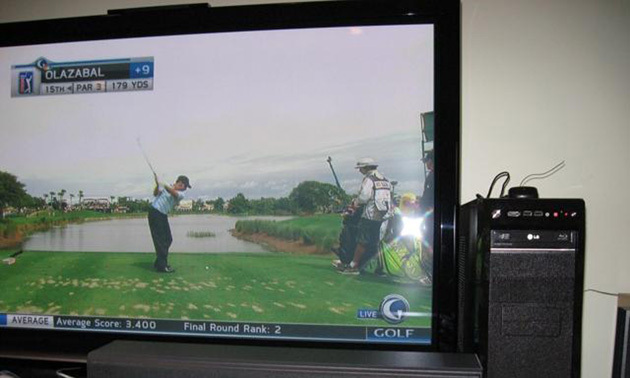 Can watching televised golf help improve the quality of your play? Absolutely without a question it can, and television broadcasts can be a great learning tool if used correctly. The key is to understand what you need to watch for and what it can teach you. In many cases we are subliminally marketed to with effectively placed endorsements which often lead us to emulate our favourite players with regards to the way they dress and the equipment they use. On another note, many will watch their favourite player and try to emulate the things they do within their golf swing. This is not the right idea; it is important for you to understand the golf swings on tour are all unique and built around the player’s body build dynamics. They are not a one size fits all type of situation. Rather than absorbing a bundle of swing thoughts and mechanical components, I highly recommend you take note of the following three keys when watching your favourite players each weekend. Pay strict attention to the general rhythm and tempo within each players golf swing. You will identify the fact they all have unique rhythms and you need to note there is no such thing as right or wrong in this area. The key is the fact they each have a rhythm and they maintain it on every swing they make. Spend some time finding your natural tempo and work on applying it evenly on all shots you hit. You will see the professionals do this with such incredible consistency and they spend a great deal of time nurturing their rhythm and you should too. Another learning opportunity takes place if you watch pre shot routines closely. Pre shot routine is the series of small rituals and behaviors which take place prior to each shot. Things like breathing, alignment, club selection and yardage calculation and practice swings. When you monitor these closely, you will once again notice there is not one single methodology in this department and the routines vary from player to player. Much like rhythm and tempo, you will note that each individual player has a pre shot routine that is consistent on each shot and settles them mentally and physically for the shot at hand. These routines are not developed overnight, nor are they created by accident. Spend time on the range building your routine and make sure it contains components which tackle your needs. Lastly, pay attention to how the touring professionals fuel their mind and body during a round. At most golf clubs you will see players consume vast amounts of carbonated pop and alcohol, as well as eating cheeseburgers, chocolate bars and hot dogs at the halfway house. These lead to wild fluctuations in blood sugar levels and potential dehydration issues, both of which blur your focus and concentration as the day progresses. When watching television, you will rarely – if ever – see the professionals drinking pop and almost always see them drinking some combination of water and sports drinks. From an eating perspective you may see them sprinkling in a piece of fruit, half a sandwich, protein bars and nuts or trail mix. Consumption takes place in a consistent grazing mentality rather than a feast or famine approach. This maintains your hydration levels as well as blood sugar levels throughout the round. Consider how you fuel your body and you will find yourself better able to sustain the quality of your play for the duration of the day. It is truly the little details that often make the difference, so pay attention to your favourite players and learn to emulate more than just their equipment, clothing and swing habits, if you wish to see yourself improve as a player.